The intraocular manifestations of rickettisial retinitis include retinal vasculitis, maculopathy, optic neuritis, and neurosensory detachment. [1–4] The vascular architecture in eyes with post-fever retinitis has been studied using the fundus fluorescein angiography (FFA)., Extensive leakage of dye on FFA may obscure visualization of microvasculature in eyes with retinitis. Optical coherence tomography angiography (OCTA) is a dyeless, non-invasive tool to assess the microvasculature of the eye. We report vascular changes in eyes with rickettsial retinitis and its response to treatment using OCTA. A 17-year-old male presented with diminished vision in both eyes since 10 days. He had an episode of fever 2 weeks before the onset of symptoms. On examination, his best-corrected visual acuity (BCVA) was 6/36 in right eye and 1/60 in left eye. Anterior segment examination in both eyes was unremarkable. Fundus examination in the right eye revealed soft exudates and hemorrhage suggestive of retinitis [Figure 1]a. Right eye optical coherence tomography (OCT) showed vitreous cells and neurosensory detachment (NSD) at fovea [Figure 1]b. Right eye OCTA showed distortion of the foveal avascular zone (FAZ) with capillary non-perfusion (CNP) areas in superficial capillary plexus (SCP) and deep capillary plexus (DCP) [Figure 1]c and [Figure 1]d. Choriocapillary layer in the right eye showed signal void areas corresponding to soft exudates [Figure 1]e. Left eye fundus examination revealed retinal whitening and retinal hemorrhages [Figure 2]a. Left eye OCT showed vitreous cells and NSD at fovea [Figure 2]b. In the left eye, SCP and DCP showed multiple CNP areas, pruning of vessels temporal to the disc, and signal void areas [Figure 2]c and [Figure 2]d. Choriocapillary slab in the left eye showed absence of signals at areas corresponding to soft exudates [Figure 2]e. Patient was investigated for chikungunya, dengue, typhoid, and rickettsia and was found positive for OX-2 antigen and negative for OX-K and OX-19. He was started on oral doxycycline and oral prednisolone. At 1 month he had BCVA of 6/18 and 3/60 in the right and left eye, respectively. At 6 months follow-up BCVA was 6/9 in the right eye and 6/12 in the left eye. Complete resolution of soft exudates and hemorrhages was noted in both eyes [Figure 3] and [Figure 4]. Both eyes OCT showed absence of vitreous cells and NSD [Figure 3]g and [Figure 4]g. In the right eye, SCP and DCP showed enlarged FAZ, reduction in the CNP area, and reorganization of the capillary network [Figure 3]h and [Figure 3]i. In the left eye, SCP showed reorganization of capillary network at macula, with decrease in CNP area and disappearance of abnormal vessels temporal to the disc [Figure 4]h. Left eye DCP showed decrease in CNP area with minimal distortion of FAZ [Figure 4]i. Choroicapillaries in both eyes were normal [Figure 3]j and [Figure 4]j. The vascular changes in post-fever retinitis has been studied using FFA., Kawali et al. 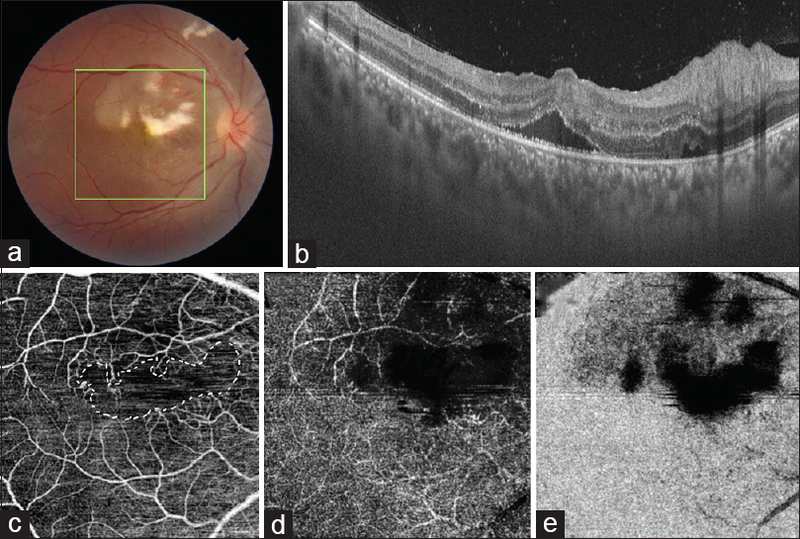 reported FFA features in rickettsial retinitis. They noted that in early phase there was hypofluorescence corresponding to the retinitis patch and in late phase there was hyperfluorescence at the margin, staining of the vessel, and leakage. Khairallah et al. studied FFA features of 60 eyes with rickettsial retinitis. They reported that vascular leakage (45%), staining of the disc (50%), hypofluorescent choroidal dots (16.7%), and delayed filling of branch retinal vein (1.7%). Advantages of OCTA like, being dyeless and the ability to visualize retinal and choroidal vasculature layer-wise helps us understand microvascular changes in the area of retinitis which was not possible with FFA due to vascular leakage. Microvascular abnormalities we noted were, CNP areas corresponding to retinitis patches and pruning of vessels. Deep capillary plexus showed profound capillary non-perfusion when compared to the superficial plexus. The choriocapillary slabs showed signal void areas which can be attributed to shadowing caused due to overlying retinitis patch. Changes in OCTA in the SCP and DCP were noted in dengue and chikungunya retinitis.,, Agarwal et al. in their report on OCTA features of chikungunya retinitis reported that there were flow void areas in SCP, DCP, and choriocapillary slabs. Aggarwal et al. in their report on OCTA features of acute macular neuroretinopathy post-dengue fever noted flow deficit areas in SCP and DCP. They did not report any changes at the level of choriocapillary. Bajgai et al. noted broken foveal avascular zone in only SCP of OCTA in a case of dengue maculopathy and these changes persisted at follow-up visits. So far in the literature there is only one report of OCTA features of rickettsial retinitis by Kahloun et al. They described hypointense dark areas in SCP and DCP, more so in deeper plexus. Similar features were noted in our case at presentation. Post-treatment with prednisolone and doxycycline, Kahloun et al. observed that the hypointense area persisted. In our case, post-treatment there was vascular remodeling with decrease in non-perfused area and appearance of new vascular lateral branching. At presentation the left eye appeared to have worse prognosis, but the final visual outcome at 6 months was almost close to the right eye. This can be attributed to the vascular remodeling at the macula in the left eye after treatment. Hence the extent of vascular remodeling determines the visual prognosis after treatment and OCTA is a useful tool in these cases to understand the response to treatment. Limitation of OCTA is that its interpretation can be challenging in presence of projection and motion artifacts. OCTA can be vital non-invasive tool in understanding the vascular changes in eyes with rickettsial retinitis and help us prognosticate. Khairallah M, Ladjimi A, Chakroun M, Messaoud R, Yahia SB, Zaouali S, et al. Posterior segment manifestations of Rickettsia conorii infection. Ophthalmology 2004;111:529-34. Kawali A, Mahendradas P, Srinivasan P, Yadav NK, Avadhani K, Gupta K, et al. Rickettsial retinitis—an Indian perspective. J Ophthalmic Inflamm Infect 2015;5:37. Kahloun R, Gargouri S, Abroug N, Sellami D, Ben Yahia S, Feki J, et al. Visual loss associated with Rickettsial disease. Ocul Immunol Inflamm 2014;22:373-8. Khairallah M, Ben Yahia S, Toumi A, Jelliti B, Loussaief C, Romdhane FB, et al. Ocular manifestations associated with murine typhus. Br J Ophthalmol 2009;93:938-42. Chalam KV, Sambhav K. Optical coherence tomography angiography in retinal diseases. J Ophthalmic Vis Res 2016;11:84-92. Agarwal A, Choudhary T, Gupta V. Optical coherence tomography angiography features of bilateral retinopathy associated with Chikungunya fever. Indian J Ophthalmol 2018;66:142-5. Aggarwal K, Agarwal A, Katoch D, Sharma M, Gupta V. Optical coherence tomography angiography features of acute macular neuroretinopathy in dengue fever. Indian J Ophthalmol 2017;65:1235-8. Bajgai P, Singh R, Kapil A. Progression of dengue maculopathy on OCT-angiography and fundus photography. Ophthalmology 2017;124:1816. Kahloun R, Jelliti B, Ksiaa I, Ben Amor H, Zaouali S, Lupidi M, et al. 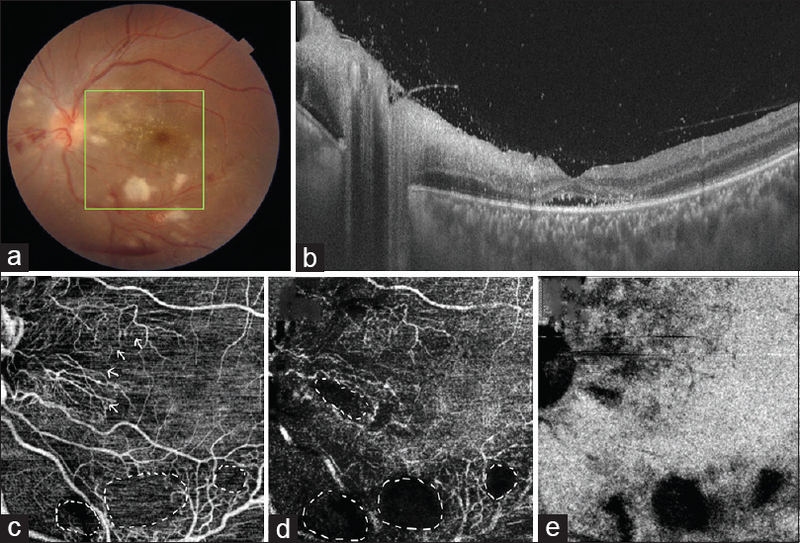 Swept- source optical coherence tomography angiography in Rickettsial retinitis. Retin Cases Brief Rep 2017. doi: 10.1097/ICB.0000000000000603.